Summertime in Florida is a time of beautiful skies, long days at the beach, and picnics. It's also the time of oppressive heat. One of my favorite things to do to cool off and stay hydrated is to eat fruit. Every one of my picnics typically has some kind of fruit, or fruit salad. 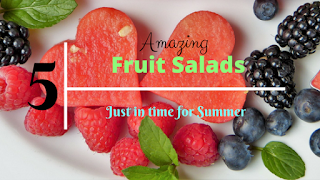 So I figured I'd share with you a few of my favorite fruit salad recipes. 1. This salad is a sweet take on an Italian classic salad. It's amazing how well fruit goes with the rich flavor of balsamic vinegar. Other fruit suggestions to try- peaches, blackberries, mangoes, or papaya. Combine watermelon, plumbs, strawberries, tomatoes, mozzarella, and basil. Mix them together well. Coat with olive oil (about ¼ cup), sprinkle salt and pepper to taste. Toss again. Chill in refrigerator 2 hours. Drizzle with balsamic vinegar right before serving. 2. This salad really shines because of the lemon thyme syrup. Any melon will work well in this salad, as well as any berry, so have fun and try new combinations! Bonus: you can use the left over syrup to make some fun summer cocktails! Or even just to flavor your iced tea, lemonade, or water. Combine honey, water, lemon peel, lemon juice, and thyme in a saucepan on the stove. Bring them to a boil. Lower the heat and let simmer for 5 minutes. Remove from heat and let steep, covered, for 20 minutes. Remove the lemon peel and thyme sprigs. This syrup will keep for several weeks, refrigerated. Toss together the fruit in a bowl. Drizzle about 1/3 cup of the syrup over the fruit and toss again. Refrigerate up to 2 hours before serving. 3. The syrup used with this salad is perfect for apples, and any other fruit that has a tendency to turn brown really fast. The citrus juices help keep fruit looking freshly cut for much longer. It also goes really well with tropical fruit. For a tropical twist, try pineapple, papaya, mango, kiwi, and/or starfruit. Combine honey with citrus juices. Whisk vigorously until well blended. Slowly whisk in poppy seeds. Peel and cut the fruit in the order listed, saving the pears, apples, and bananas for last. Immediately coat with the poppy seed syrup and toss. 4. This salad has an amazing texture, and is a bit more hardy than other fruit salads, because of the addition of quinoa. The vinaigrette is also jam packed full of amazing flavor, and can be used on any salad, so I tend to make extra. You could also change up the fruit here, try it with pineapple, kiwi, banana, guava, papaya, strawberry, dragon fruit, prickly pear, or blackberry. Combine honey, olive oil, lime juice, salt, cilantro, and chipotle in a blender. Blend until well blended. Cook the quinoa as directed on the package and let cool. Combine all other ingredients and lightly toss. Add in the quinoa and toss well. Drizzle about 1/3 cup of the dressing over the salad. Toss one last time and serve. 5. This recipe is a bit boozy, so adults only! But it's so tasty and if you want to make it safe for the younger generations, just leave out the rum and use ¼ cup water instead. Other fruit that go well in this recipe include strawberry, pineapple, cherry, watermelon, blackberry, banana, pomegranate, dragon fruit, peach, or green apple. Combine honey, rum, and lime juice in a saucepan. Bring to a boil and lower the heat. Let simmer for 5 minutes. Remove from heat, stir in the mint leaves, cover and let cool down to room temperature. Combine honeydew, cucumber, and grapes in a large bowl. Drizzle glaze over fruit and toss well. Chill up to 2 hours before serving. In any of these recipes, feel free to change the fruit around. Play with different dressings and glazes. Use ginger instead of mint in the mojito glaze, or try using a strong herbal tea anywhere you see water or juice. Have fun, play around, and let me know what you think below!